...but very busy dealing with our house move. We now reside in north Chelmsford, Essex and today was my first day back in the office since the move. Despite having had a week and a half off work, I haven't picked up any brushes for the past 2 weeks and in fact only found my brushes again last night! Unpacking is taking much effort and work on "my room" has now halted until I have various bookcases and shelves fixed to the walls. Hugo is in a new nursery and refusing to settle - his daily cries of "no, mummy, no" when dropped off in the morning are very sad to hear; hopefully he will be better after a couple of weeks. This morning's commute took an hour and three quarters in total, but then I took the wrong train and got confused when changing onto the Underground at Stratford. Anyway, at least the stress of the house sale and purchase is over (that stress being caused almost entirely by our buyers, whose unreasonable and, quite frankly, dishonest behaviour was appalling) and, more importantly, all my wine survived the move! Hopefully normal blogging service will be resumed shortly. In the meantime, here are a couple of photos of what's next. Also, I haven't had any internet access for the past 2 weeks whilst at home, so apologies for not viewing/commenting on readers' own sites during that period. 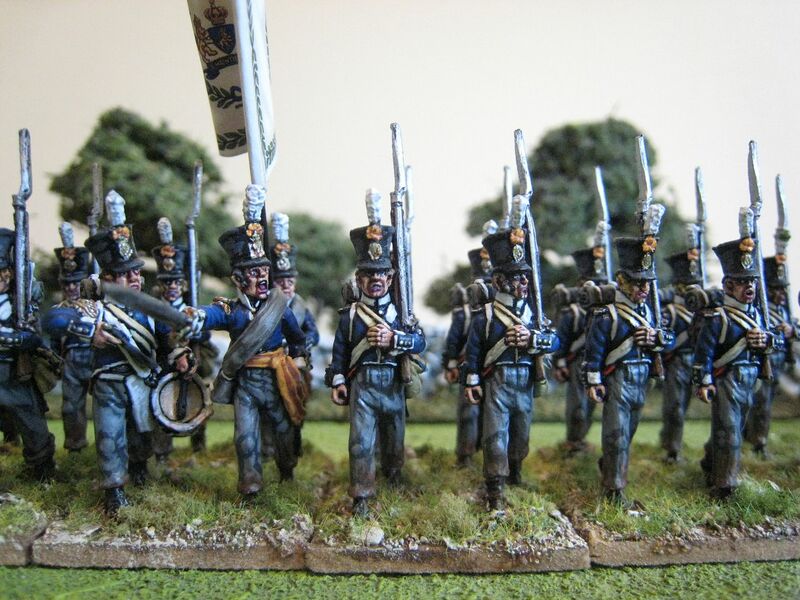 This is the 2nd Line Infantry regiment of the United Provinces of the Netherlands. 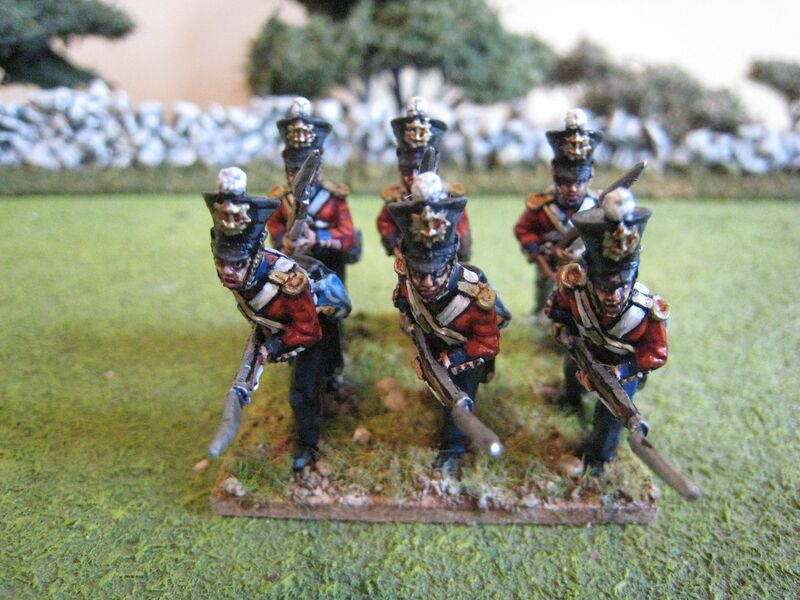 The 2nd was a Dutch regiment, as opposed to a Belgian one. It was in the 1st Brigade (Ditmers) of Chasse's 3rd Netherlands Division. This division, which contained newly-raised and untested troops, was posted on the extreme right of Wellington's line at Braine l'Alleud. Chasse himself had been a general in the French army prior to the country's creation. At around 3pm the division was ordered west to occupy a position in the centre of Wellington's line. 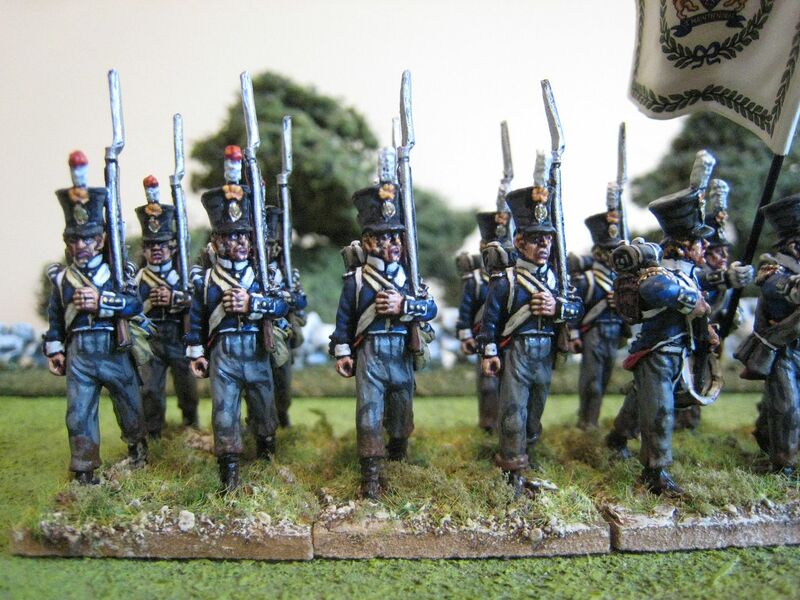 The regiment joined in the attack on the Imperial Guard late in the day, bayonet-charging the 3rd Grenadiers. 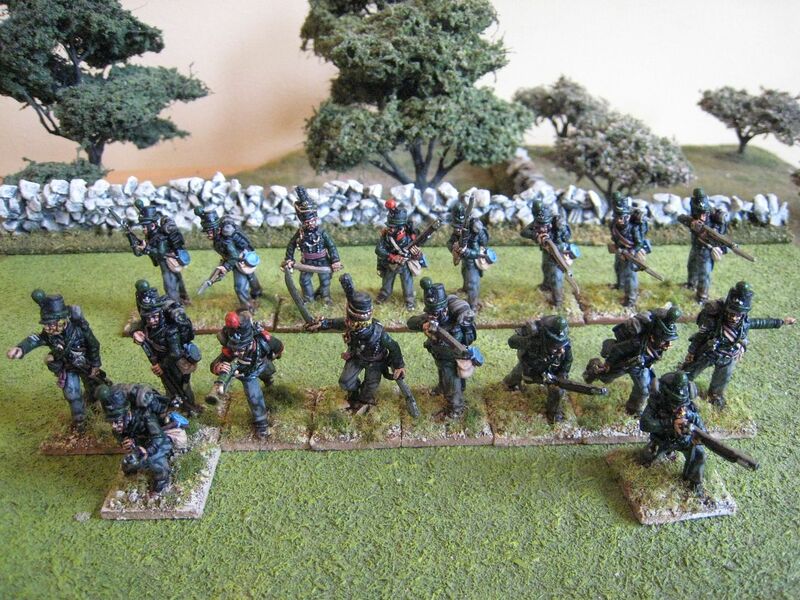 The General de Brigade rules orbat requires 24 figures, organised into 4 centre companies and 2 flank ones. 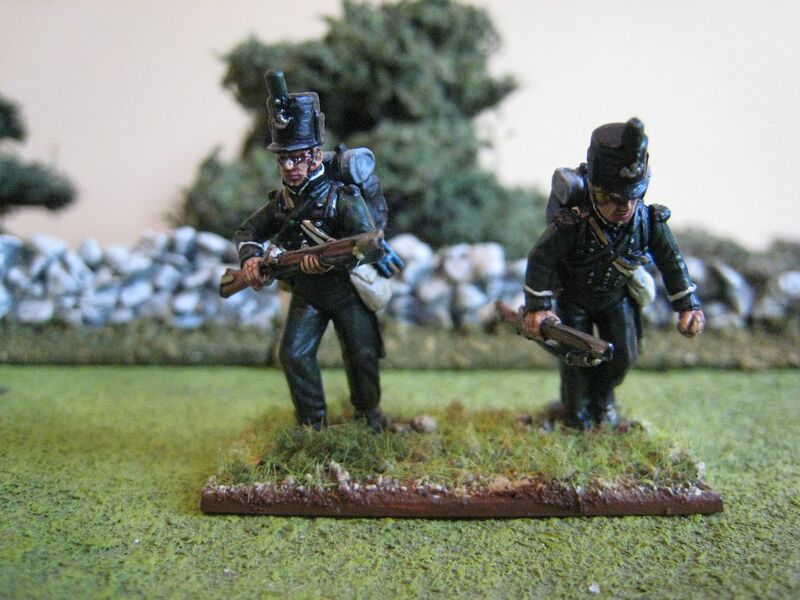 Something I hadn't realised until researching this unit was how few Netherlands line infantry regiment were present in the battle. If you look at the orbat for the 2nd and 3rd Netherlands Divisions (the 1st remained north of the battlefield, at Hal) you see that many of the non-Nassau units are either jaeger or militia battalions. 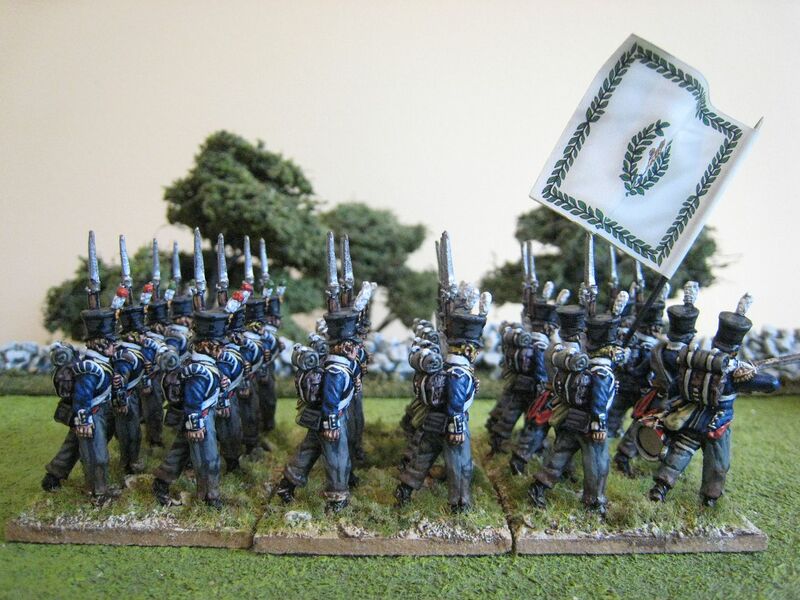 The General de Brigade orbat (which I think leaves out some units from the 3rd Division) has the 7th (Belgian) Line in Bylandt's brigade, the 2nd (Dutch) line in Ditmer's brigade and then the 3rd (Belgian) and 13 (Dutch) in Aubremme's brigade, the second brigade in Chasse's 3rd Division. That's only 4 line regiments, which surprised me at any rate. 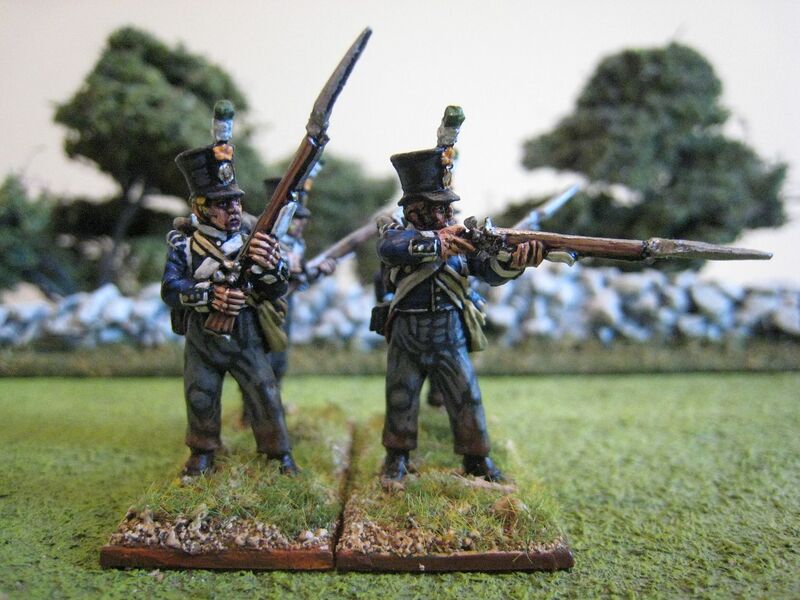 As I mentioned before, I had intended to add to some existing figures that I painted a few years ago when the Perries first released their Dutch-Belgian range. 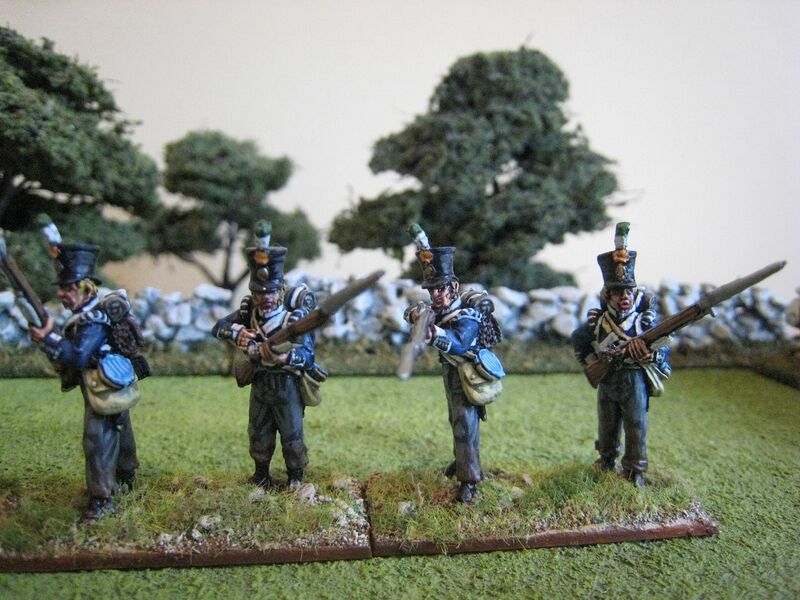 However, I decided that I had painted those figures's tunics in a blue that was not right. 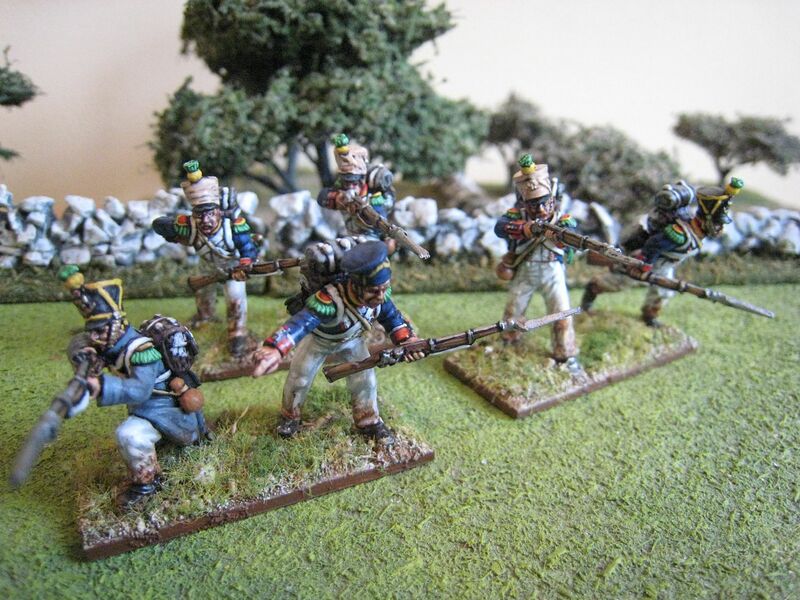 Adkin reports of "friendly fire" incidents when Chasse's division appeared on the field late in the afternoon and the troops on the ridge thought they were being outflanked by French infantry. 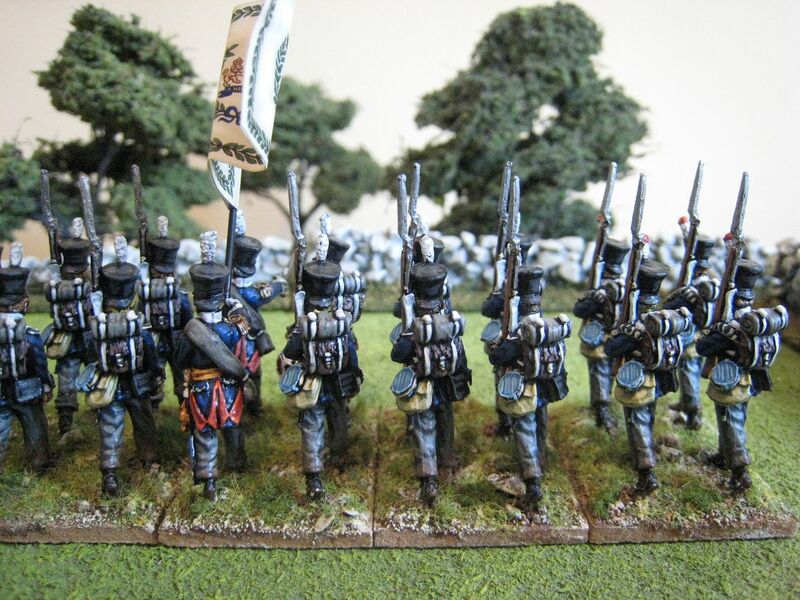 I suppose in the heat of battle one shade of blue looks quite similar to another, but I decided I wanted my Dutch-Belgian infantry to wear the same blue coats as my French infantry to reflect how easily they could be confused for one another. So whilst I previously used Foundry's "Night Sky 62", this time around I used "French Blue 65" highlighted with "Deep Blue 20B". I used "Stone 57" for the trousers. I painted an extra 4 light company figures on skirmish bases and then decided I might as well paint the other 2 in the pack. They can migrate to the 13 (Dutch) Line in due course. 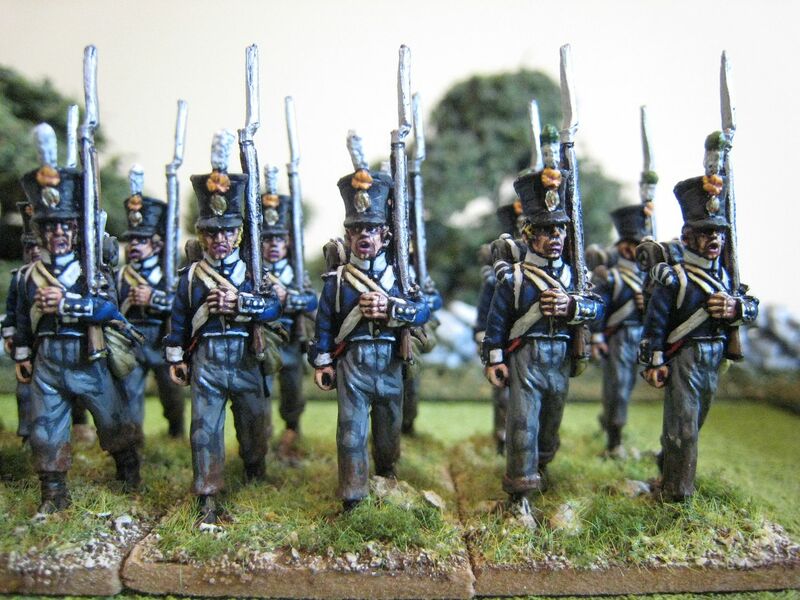 Why did I paint this regiment? 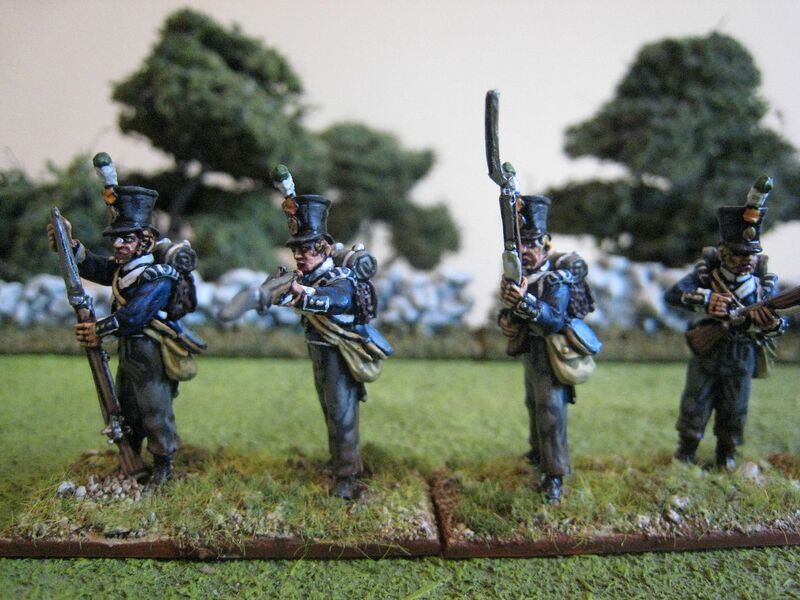 Simply because I had the figures in the leadpile and, to be honest, I like painting these slightly out-of-the-ordinary regiments for the Waterloo campaign. 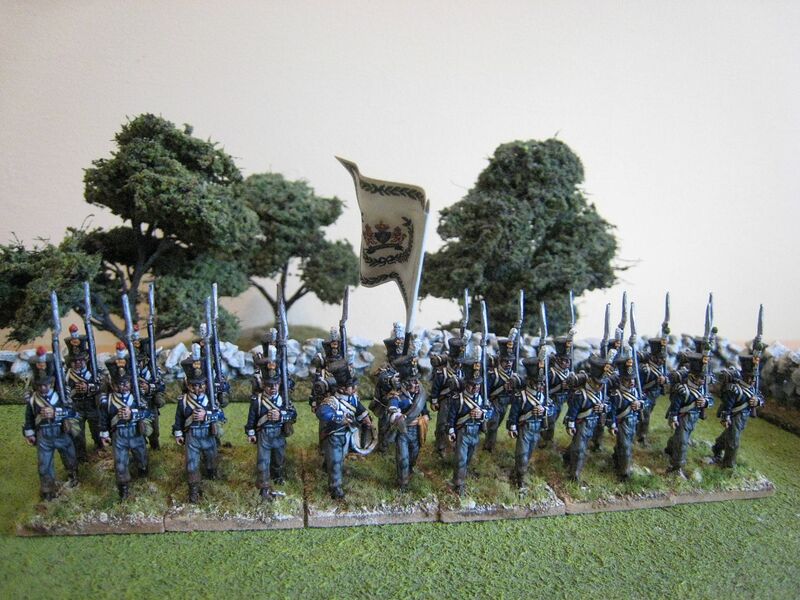 Next up is the 2nd Light Battalion of the King's German Legion! 30 figures. Painted September 2011. Flag by GMB.